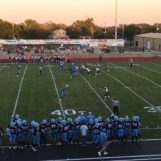 Scott City, Kan. (westernkansasnews.com)–Playing in front of a packed home stands at Darner Field, the Beavers wasted little time to get the scoring going. They scored on their first seven possessions, and pitched their third straight shutout with a 61-0 win over the Goodland Cowboys in front of the new stadium. Following a Goodland fumble on their first play from scrimmage, Scott City needed two plays to scores. Wyatt Hayes would cruise in from nine yards out with 11:09 left in the first quarter to go up 7-0 after the Moses Hinojos PAT. The Beavers would go 64 yards on their second series in just three plays, as Brandon Winderlin scored from 10 yards out with 5:34 remaining in the first quarter to extend the lead to 14-0. Following the Cowboys fumble and an offsides, Scott City needed only one play to score. Parker Gooden connected with Marshall Faurot on a 29-yard pass play with 5:34 left in the first quarter to go up 21-0 with the Hinojos PAT. The Beavers would score once more in the opening period. With 2:47 left, it was Hunter Yager finding the end zone from three yards out to go up 28-0 with the Hinojos extra point. Scott City continued to roll in the second quarter, scoring on three of their four possessions. In the first minute of the second frame, Hayes would find the end zone from 16 yards out with 11:12 remaining in the half to add to the lead at 35-0. Nearly three minutes later, the Beavers would score on one play through the air. With 8:47 left before halftime, Harrison King hit Parker Vulgamore on a 55-yard touchdown pass to extend the lead to 41-0. The extra point was wide left. Scott City scored two more times before the break. Following a 69-yard punt return to the Cowboy 1, Hayes found the end zone for the third time in the half on a one-yard plunge with 6:46 remaining in the half to go up 48-0 with the Hinojos PAT. The next score for the Beavers would come from the defense. On third down, defensive lineman Gabe Bowers picked off the screen pass, and rumbled for a 36-yard touchdown to add to the lead at 55-0 with 5:25 left in the half after the Hinojos extra point. No scoring in the third quarter, as the running clock rule was enforced. Scott City closed the scoring out with approximately 8:33 left on a seven-yard run by Kevin Duong. The Extra point was missed, and the final turned out to be 61-0 Beavers. Scott City rolled up 330 yards of offense in the game. Wyatt Hayes rushed for 75 yards on six carries and had three touchdowns. Cale Goodman and Kevin Duong had 30 rushing yards, and Brandon Winderlin rushed for 56 yards with a touchdown. The Beavers finished with 239 yards rushing. Harrison King went 2-3 for 62 yards with a touchdown, and Parker Gooden completed his lone pass attempt for 29 yards and a touchdown. Parker Vulgamore caught one pass for 55 yards, and Marshall Faurot had a 29 yard reception for a touchdown. Goodland finished with 56 yards of offense. Joe Mann rushed for 38 yards on 10 carries, and Leyton Cure went 1-8 through the air for 14 yards, completing a pass for 14 yards to Blake Sanderson. With the win, Scott City improves to 3-0 for the 13th time in 15 years, and have now won 15 straight and 21 out of the last 22 over Goodland. The Beavers hit the 60-point mark for the first time since 2014. It’s also the first time since 1984 they have started a season with three shutouts. Goodland is now 0-3 for the first time since 2009. Friday night’s game also counted as a district game in Class 3A, District 8. Scott City is 3-0 and will host 2-1 Ulysses next Friday. The Tigers snapped a two-game losing streak to Hugoton, with a 29-6 win. Goodland is 0-3 and hosts Oakley next Friday. The Plainsmen dropped to 2-1, falling to Norton 26-24. The Bluejays scored with seven seconds left to rally for the win.